Since the inception of the business outsourcing process (BPO), the working styles have changed considerably all over the globe. The greatest benefactors of the process is the small and medium business owners who have managed to make their workings smooth and are now able to focus more on their business growth and expansion. Since the business owners have more time to plan and invest in their business’s management, taking the virtual assistant services has become a blessing for them. The popularity of the VA services has become stronger due to the never ending changes and developments in the IT sector. The outsourcing companies offer a wide range of products for their customers which are designed to suit the needs and budget of a small business owner. As a small business owner is not in the position to hire a team of assistants in his office, he needs some service provider who can cater to his needs without charging too much. The VA services providers are his key contributors to share his office workload at a price the business person can easily afford to pay. The professionals working as the virtual assistants are specialized professionals who are intensively trained to become flawless in their duties and the work provided by them matches the highest quality standards. Since a business owner needs time to travel around the city, meet new clients, attend meetings and seminars, managing the work inside the office can be a trouble because it also needs to be done with care and requires a lot of time. If the business owners start spending time in their offices to enter data in the systems, create files and do all the work of an assistant, soon he would only be confined to those tasks and the number of clients he has. There would be no more time to think about growing the business to the next level, and expansion would only be a dream. We all have 24 hours in a day and have to manage everything in this time. We have to attend the business matters, the family matters and also need time to socialize because it is very important for the business. 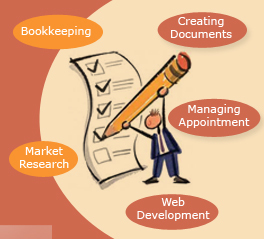 But if a business becomes a one man show, there is no way everything can be managed on a daily basis hence the need for virtual assistant services becomes inevitable. As the virtual assistants take care of the administrative tasks, the business owner can spend his time on more pressing issues and tackle more serious problems. This entry was posted on Tuesday, April 15th, 2014 at 11:30 am	and is filed under Virtual Assistant Services. You can follow any responses to this entry through the RSS 2.0 feed. You can leave a response, or trackback from your own site.